As always this time of year, I start planning my last minute knitting projects for the folks on my holiday gift list. This year is no different. Some of the ideas I have been considering are the Homespun Throw, the Fairisle Mittens and several cowls (patterns downloaded from Ravelry) knit in Mountain Colors 4/8's Wool. The Homespun Throw is very fast and easy to knit but the results are stunning. Last Fall Diana made 3 different throws for folks on her holiday list. The pattern calls for 3 skeins of Homespun Wool/Silk but on one of her throws she used an extra skein of yarn to make a larger throw. This yarn comes in ALL of our colorways and makes a wonderful gift. 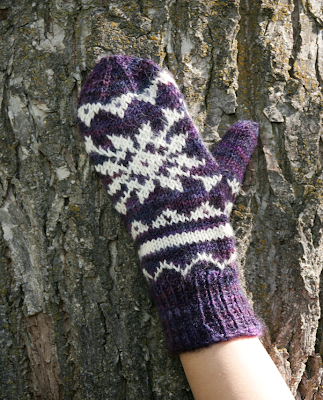 The Fairisle Mittens use a colorway for the background and a Solitary solid cream color for the pattern stitch. This could easily be reversed for another fun look. These are knit in Mountain Colors Mountain Goat but our 4/8's Wool would also work. For a cowl I am planning to use our 4/8's wool if worsted weight is used in the downloaded patterns or our Weavers Wool if a finer yarn is needed. I think I could make several of these before it's time to ship my packages. I'm off to start knitting. How about you? ?